We had a fine show in Dallas. The crowd was intoxicated in a great mood, and we hit several correct notes. Monte Montgomery was absolutely amazing. The only flaw in the evening came at the end, when we did our signature closing song, the musically challenging "Wild Thing," at the end of which we traditionally hurl our kazoos into the crowd. One of the kazoos hit Monte's wife in the forehead, causing a cut. She was a good sport about it, but in professional music circles it is not considered a good thing for a band to inflict kazoo wounds on its audience. Several blog folk were in the crowd, including ASK, formerly known as elfbrains, who gave me a T-shirt with a blog screen on the front. 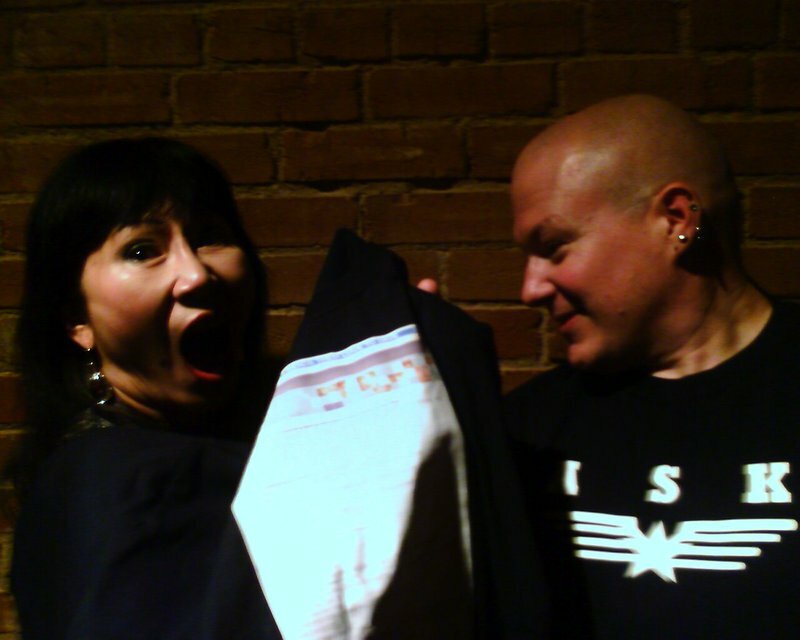 He can be seen below ogling Amy Tan, who is holding up the T-shirt to shield her nakedness. Today we fly to Denver, where we perform tonight to benefit Denver SCORES. Hope to see you there! Wear forehead protection. Wow, who was the first one to catch the skull-splitting kazoo after the injury? Monte's wife was proudly clutching the kazoo after the show. Nice job, ASK! And please post a pic of MOTW! The ASK: way to go! Amy looks suitably shocked and awed. Where's MOTW? And Amy Tan is definitely naked in there somewhere. I can proudly report that the band did not live up to its reputation. Is that the only expression that Amy Tan has? And to answer CR's question from yesterday, no Tan lines. Dave? Is Ask just as cute in person as he is on the blog? *whispers* Amy scares me. Just a little. Oh, is Amy Tan any relationship to Christine(?) Tan on CNN? Kazoos, no one said there would be kazoos. I knew I should have flown to Dallas! Way to go ASK--cool idea to put the blog on a T-shirt. Was it an excerpt from your favorite comment? In that pic the shirt looks kinda like some heavy guy's underwear, though disturbingly French-cut. This is SO cool because I majored in Kazoo in college! AND I could be in the band, since I have my KhD (Kazoo Hurling Degree). '...we "sit" several correct notes.' ? He meant to do that. He did. Just one of Dave's subtle humurous hidden meanings, of which I don't understand...being Musically Challenged. Is 'oogling' the same as ogling an oosik? Or is it googling an ogler? Aaaaarrrrrrrrrrrr! I've got the pictures, plenty of them. Just need to know where to post them. Great show, much better than advertised. either that or the 4 limey beverages, 2 aged flavored waters and 1 fermented cactus juice affected my hearing. It certainly was not a loss of judgement. Great to meet you last night, ASK. JaLaG! ASK told us he met you! Stick around, tell us more! Um, let's keep it that way, okay, guys? Hey, that thigh comment was the 24th one!!!!!!! We're not buyin' it, JT. Can't fool those who live in the same glass house. Hey! Who shattered my northern wall? JT - The extra "o" is for emphasis. Those who throw stones at glass houses should always wear proper protection. Hooray! Yea, ASK! But dang, I wanted a MOTW pic, too. At least they should dress in the basement. Hey Ask...if you email me your pix....I'll post them and give the blog the link. Hey, who wants to geet together as a group this summer to take Dave to see "Snakes on a Plane," thereby helping him face two of his biggest fea--um, two of his biggest concerns as an American taxpayer? "geet" = "get together" + "meet"
Woo hoo! ASK on the crapcam! I did not make it in time for the CrapCam session, but someone used my dinosaur-age film camera to take a picture. 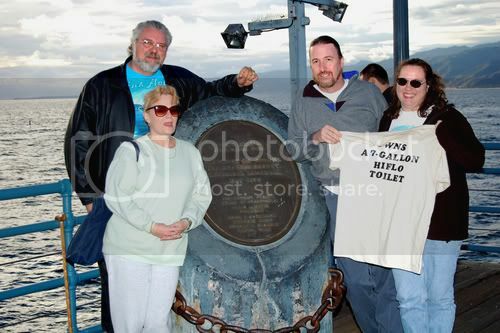 Of course, I'll have to finish the roll ("Okay, kids, now YOU stand in back and let your brother sit in front..." "MOM! How many more pictures do you need of us?!" "Uh ... about 22. No, wait! It'll be fun!" *takes pictures of them walking away*), get it developed, and figure out how to get it posted. But I will and then you'll finally get to see what a MOTW looks like. I only have a few from my crapcam - JaLaG has some good ones. You too, JaLaG! Enquiring minds! And there are rumblings of an NYC summer blogmeet, to which I will travel if I can get a little help from the babysitting g0ds. Go, ASK! Yeah, we want pics of all you other blogits and lurkers. You just can't hide from the CrapCam. Or can you? Will airmail a brand new 36-exposure roll of film to MOTW! I used to have the same impulse to always fill up a roll of film before developing. That's how I ended up with film rolls that had anniversaries of their own before seeing pics. Please consider just wasting the rest of the roll and getting the pics developed & scanned! Any major pharmacy will develop and scan them for you in an hour nowadays. I will be extremely glad to make the over 15-mile trek from my home to NYC for a blogmeet. Yes, I am willing to go to such lengths, so please don't even bother trying to stop me; I won't hear of it. You think I'm kidding - have you ever gone through the Lincoln Tunnel on a bad day, i.e., most days? Yay, LBFF! That's the spirit! Let's make it happen, guys! Is Amy Tan trying to become the new icon formerly held by Munch's "The Scream"? At least we have decided to stal... erm... admire a celebrity who is somewhat accessible. Can't wait for the pictures, MOTW! I really like to connect a face with a name. Actually, Blue does have a point. I can probably make it to NYC on a train from Boston in less time than it will take the Meanie Mobile to get through the Lincoln Tunnel. So... yay, Blue! That's the spirit! I really like to connect a face with a name. Blue - at the concert last night, we drove 40 miles, ASK drove ~30 (right? ), and one guy drove up from Waco - 100 miles away. Trains, buses are an option for me too, actually. JT - you're a local? I'm in Montclair NJ. And I am kidding about the Lincoln Tunnel. It does get monumentally messy very often, but there are other options, and I know them all, being the intrepid navigator and lifelong NYer (now NJer) that I am. I can find my way around, and would happily pick up and drop off anyone in NJ within a reasonable distance who doesn't want to go in to NYC on their own. My e-mail address is good below. I recommend a propeller beanie. Don't you think "BAG 'N' FARB" WBAGNFARB? The ASK - we didn't meet any other blogers (pretty new to this blog) but you were about two people in front of us. I was wearing a blazer - short blonde hair, my hubby was in the blue windbreaker, he has grey hair and mustache. Actually many correct notes were heard, and Amy Tan was pretty amazing! It was tons of fun. We were going to bid on the guitar (hubby and I just spent last weekend at the vintage guitar show here in Dallas) but it got a bit pricy. Glad to know that Dave has good taste in beverages. And I haven't killed anyone yet. Well, they say that looks can kill, but I wasn't counting those. Wow! My ATOR (Amy Tan Ogling Rate) has gone from 0 to 2 in 2 days! Please don't tell my wife! I was also thinking if a member of this band/grocery store was named William Bag, or some such, it could be: W. BAG 'N' FARBS. ...I guess in that case the FARBS would be the other band members/fibrous carb groupies. Well, I am definitely willing to take the XPress bus in from Brooklyn, unless you want a tour of "sites from Saturday Night Fever and other Bay Ridge movies" in which case you can come to my place. Nice pic, ASK! Way to go! I agree with whoever said that the shirt looked like undies. It really does, until you look closer. Wonderful picture, ASK. You rock! I also vote that the shirt looks like it has tidy-whities on it. This Philly gal could be willing to SEPTA/NJ transit it up to NYC for possible gatherings - keep me posted! Will be in touch, sthnbelle. By the by, I was the one who took the picture of MOTW. I also realized how used I've gotten to digital cameras -- when she handed me her camera I spent a couple of seconds looking for the LCD screen on the back. D'oh! Oh, and on seeing Ted in person: No, I don't think that's a mullet. Thanks, Fax! I'm still amazed at how far you drove for the RBRs. No one has mentioned it yet, but we were treated to seeing the full Monte (Montgomery). Dizzying, that's what he was. I had the extreme pleasure of being there last night. I've been mostly lurking & posted exactly once before...I saw ASK & MOTW but had no clue who they were. I was also close the front. Blew off a roll of film in about 20 minutes (digital camera batteries all dead--phooey!) and then today discovered that I had loaded black & white film (not the C41 film, but the gotta-send-it-off-or-develop-it-yourself stuff). It may be a while before those make it to the web. Anyway...DENVER & LA, get your butts to the show. They were great! And I was also blown away by Monte--I don't think you guys will get that treat. Photo_Tim, get that film developed! We like black and white too! My date and I were standing right behind ASK. I got a few decent crapcam pics (wait... is that possible?) and they can be seen here. sidehike: great pics! Thanks for sharing. sidehike, the pics are fun. For me, the next best thing to being there! Ooh, let me know about any get-togethers. I'm from NJ too, although now I only live there in the summer. Gotcha Mew. Will be in touch. Sidehike-Thanks for the pics. It looks like so much fun! Thanks for the pics everyone (how could you not know it was me - I was drunk and had ASK on my shirt - both very identifiable traits). Thanks to all for the B&W tips. I can actually develop them myself, it's just a time thing. O - thanks for the tip. parisphoto is possible, there is also a lab in Dallas, but price there can be an issue. Make sure there's a space between A and HREF, no other spaces elsewhere. Yep, I did it the way Meanie recommends. JaLaG - AWESOME nonCrapCam pictures! Further hoopla for JaLaG! Good going, both on photography and linkography. The Dallas Morning News actually sent a music critic to review the show based on the quality of the music. Key words: "a level of musical expertise", "accomplished", "margarita"! You may need to register to view it. Photo_Tim, if you haven't, please e-mail that review to judi (daveblog@herald.com) so she can post it on the front page. I didn't like that review as much as I liked THIS article. did anyone notice that Dave changed "sit" to "hit" in this post? I think it was left better as "sit" so we could contemplate what he actually meant by it.